Wedding traditions and customs bring to our weddings magic and turn it into unforgettable memory and beautiful occasion. The wedding is not a just ordinary holiday; it is a fairytale for two people who found each other for endless love. As a wedding ceremony, one of the most important ceremonies in our society and marriage is the greatest values in the modern community, you can find a lot of different customs and traditions all over the world. Traditions, customs, and rituals respected as a symbol of society’s prosperity and well-being. They play important role in social interaction. Saving the traditions and customs is very important for our cultural heritage. Every country has its own wedding traditions, which unique and uncommon. So important for the younger generation don’t forget beautiful wedding traditions of their ancestors and breathe new life into them. There some wedding customs which are a thing of the past and some which have become immortal and will be always with us. And today these traditions are a big part of the wedding ceremony. As like a white wedding dress or wedding cake cut ceremony and wedding rings. What do we know about wedding traditions? All that we know is that there a lot of different popular customs in every country. ­­All these traditions vary from country to country, from nation to nation and even from city to city. Some of these traditions of wedding and betrothal are an integral part of the ceremonies for our parents and the older generation. And they cannot imagine the marriage without such wedding rituals and customs. As well as all traditions change from country to country, wedding traditions and rituals vary and change too. There are certain wedding traditions which unite us and became famous and well-known all over the world. For example to make a big wedding party or wedding dinner is one of these uniting traditions. There are certain rules and circumstances in every nation for marriage, which we can call as traditions too. Traditions of every nation are a bridge between the past and futures of the nation. Every custom is a keeper of ancestors’ history. It’s so important to save and respect our traditions. Most of them are built on such great qualities, as like humaneness, heartedness, and generosity. Local entertainments and religious rituals were a uniting factor for ancient society, which didn’t influence wedding traditions strongly. Why Wedding Dress Is White? The history of a wedding dress as old as the hills, and goes to the distant past. We know that in Ancient Egypt was a tradition to dress bride some special clothes. The Linen dresses of that time were far to be elegant as like modern wedding dresses, but Egyptian brides preferred these dresses because of their white color. And in Ancient Greece existed a tradition of wedding dress too. The white color was here a symbol of the festivity and solemnity. This tradition was continued and in the Rome Empire. Roman brides were dressing white caftan in the yellow dress. White color impersonates innocence and pureness. In ХVI century emerged different models of wedding dresses which will have been the inspiration for modern models. These dresses had a train about 5.5 meters long. Queen of Great Britain Victoria had one on her wedding day. In this period white color began symbolizing purity and chastity. Cutting wedding cake procedure is one most pleasant and delicious ceremony for the wedding. History of this tradition as like history of wedding gown is very old. There was a tradition in Ancient Greece to toss breadcrumbs over newlyweds, they believed that ritual will make their life cheerful and marry. Similar customs were in others societies. Bread, rice, and breadcrumbs were embodying well-being and happiness. Much later thanks to French confectioner this tradition took a form of elegant wedding cakes. So we can say that the Middle Ages have given us one of the delicious and nice wedding-day traditions. Perfect kiss of the bride and groom in front of wedding cake is nice Britain tradition and people believe that kiss brings happiness, welfare, and contentment to their lives. It’s believed that the higher wedding cake you have the more chances of happy life newlyweds will have. It was the reason of appearing popular taper wedding cake as known as Croquembouche. The cake is made from profiteroles, soft custard and caramel can often see at weddings. The high wedding cakes became usual on marriage ceremonies all over the world. Why The Bride Toss Her Wedding Bouquet? This tradition of throwing the bridal bouquet appeared in England when people believed that piece of the bride can bring them happiness and luck. So they try to capture anything from her and tried to grab even her flowers. And it was really the problem for the bride so they began to throw it to people. The throwing the wedding bouquet is very amusing and playful custom. At the end of the wedding ceremony, the bride throws back her bouquet over the shoulder. There is a belief that a girl who was able to catch it will next bride. In some countries, there is tradition to throw the bridal garter with a bouquet. The groom throws it. And boyfriend of the girl who caught the bouquet tries to catch the wedding garter. According to Christian wedding traditions after the words: “You may now kiss the bride” groom kisses the bride for the first time as his wife. In the past, this kiss was as like seal of the contract of their love. 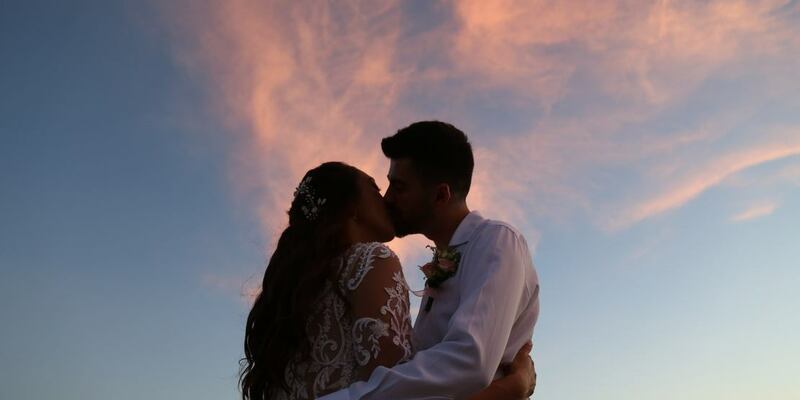 By the first kiss, the bride and groom were connected for eternal love. Souls of two lovers were intertwined as one whole after the kiss. There was emotional and sentimental part of a kiss when the groom kissed the bride in her forehead. By this kiss, a groom was demonstrated: “ I took you under my protection and I will care about you until I die.” This first kiss was showing their past and future love by action. Origin of the tradition is very old and if we look throughout human history we can find different similar wedding traditions. As like to toss on newlyweds rice, seeds, breadcrumbs, petals, salt. All these were symbolizing prosper and happiness. Besides this petal of roses were a symbol of purity and depict innocence. And they were used to symbolize losing of fertility by the bride. There are some traditions which can make us smile. All these innocuous traditions were made by good intention. They gave hope to new couple to find good, prosper life without starvation, our ancestors needed this hope under hard living conditions. Why Do The Bride And Groom Wear Wedding Rings On Left Hand? Our ancestors believed that from ring finger on left hand run the vein directly to the heart. Since that time we keep wearing the wedding rings on the left hand. Since 2800 BC ring or circle were personified infinity and eternity as much as the circle does have no beginning and no end. And the wedding ring became a romantic symbol of endless love which was wearing on wedding finger on left hand. There is a second legend regarding the wedding ring and it came from China. In Ancient China all fingers on our hand were embodying one of the family members. The middle finger is you, the thump is the symbol of your parents, pinkie – your children and ring finger is your wife or husband. And if you open your palm and after this bend your middle finger, you can see that all fingers set apart from middle finger except the ring finger. It’s like you (middle finger) and your wife (ring finger) always together.